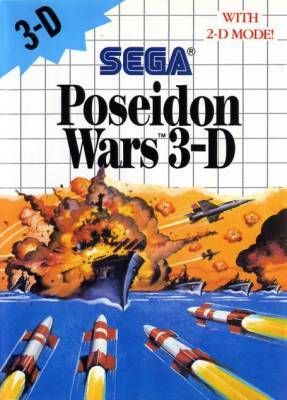 Poseidon Wars 3-D - Games - SMS Power! 55 CVG magazine "Complete Guide to Sega"
Battle Stations! Battle Stations! Your country is being attacked. You'll be fighting on the U.S.S. Poseidon; an armor-plated attack cruiser with radar, sonar, 76mm cannons and surface-to-surface missiles. First come the training rounds. They'll throw everything they have at you... jets, cruisers, torpedoes, cannons. And then the fun really starts! Combat missions! You're on the open seas. You have blips on the radar. Line up your gunsights and let 'cm have it. 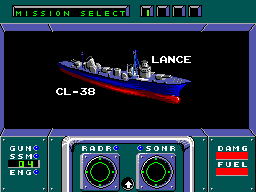 You pick up an enemy cruiser on your sonar. Get ready with an armor piercing missile and send them to Davy Jones locker. 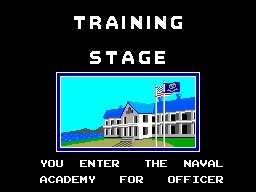 If you complete your missions, you will be awarded with the Navy's highest honor...a promotion to Fleet Admiral. 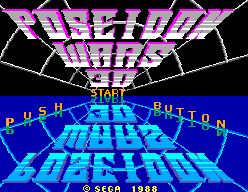 Best of all, you can play it in SegaScope™ 3-D or in 2-D. So everyone can play. But command the Poseidon well, or the enemy will send you to the briny deep!